The competition closes at 23:59 on Sunday 24th December 2017. Entries received after this time will not be accepted. The competition can be entered by posting who you’ll be driving home to spend Christmas with this year as a Facebook message to the Family Holiday Association or a comment on the competition post, on Twitter, or as a comment on the Instagram competition post. The prize is a £50.00 voucher towards car hire at Holiday Autos. There will be one winner who will be announced in the New Year. The home address of the winner will be requested in order to send the prize on. The voucher can be used once against car hire purchased through holidayautos.com. The voucher has to be used in full and cannot be carried across multiple bookings. The voucher is valid for 12 months. 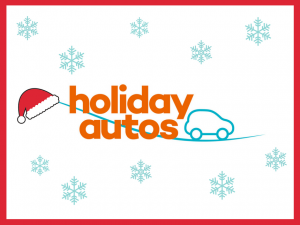 The Family Holiday Association and Holiday Autos accept no responsibility for any damage, loss, liabilities, injury or disappointment incurred or suffered as a result of entering the competition or accepting prizes. The Family Holiday Association and Holiday Autos further disclaims liability for any injury or damage to your or any other person’s computer relating to or resulting from participation in or downloading any materials in connection with the competition.